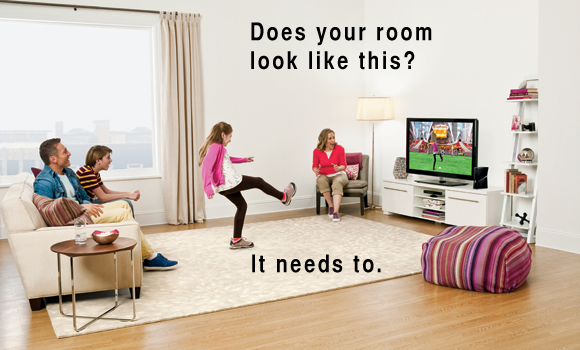 Kinect looks like a lot of fun and I do have a room that would accomodate it. However, $150 is a lot for something that might have the novelty wear off within a couple of months (see Wii). I'll wait to hear reviews from other users after it's released to make my decision. Also I haven't used my PS3 or 360 cameras in a while, but they're close by if needed. I liked gameface abilities on Tiger and R6 Vegas. But I am a bad example, as I bought a PSP Go just to be able to play Eye of Judgement Legends. Such a great game, it still makes me sad that Sony shutdown the servers for the PS3 version. I've got one of those finished basements with a low drop ceiling and a low support beam. I can't even play Tiger Woods on the Wii without my hands and the Wiimote hitting the ceiling when making a full swing. So I can't see playing games where I jump up in the air and flail my arms around. Kinect is out for me as long as I live in this house. I might be getting a shiny new 250gb Elite Xbox 360 + Kinect bundle for Christmas so it appears I may be the guinea pig after all. This isn't something I would buy for myself right now, but if I can get it for a gift I'd love to try it out. Plus, I've been pretty envious of those new 360's and I need to upgrade from my 20gb hard drive. I should know for sure in a few days. I have the best in-laws! Chris: We're waiting for impressions (when yours arrives). I just finished reading a review of the Kinect. Finally, I have found something that rivals the PS3 for my dis-interest. The room requirements alone are ridiculous. I'll get it at $39.99 bundled with a game. That will probably be the same week I get my PS3 slim at $79. I've been watching the GiantBomb stream where they've been playing Kinect all day. Some of it looks neat, but it also looks slow and janky in the dash and really clumsy in use. The avatars sometimes get distorted. Some reviews are not kind at all. Yeah I'm reconsidering as a result. Right now I'm thinking I'll just upgrade to the 250gb 360. How does the transfer cable work with the internal hard drive? Mine arrives either tomorrow or Saturday. The estimate is Saturday. I've read several of the unkind reviews, but I've also read a lot of positive things from the beta testers in the comments refuting things said in the reviews. At this point I'm just trying to keep an open mind. I don't mind the risks of being an early adopter and I still believe in the technology and am looking forward to playing around with it and seeing what the developers can do in the coming months/years. I'll hopefully be giving my subjective impressions Saturday. Not getting mine until after Thanksgiving. Sold about 20 units (standalones and bundles) and still have people calling about it. Spoke to the 8-9 people that came out for the midnight launch last night and they're loving it. It's apparently really quick & easy to setup, and Dance Central, Kinect Sports and Joy Ride are great fun. Been hearing positive things about Your Shape from a few customers as well. No complaints about setup or anything else as of yet. This is the vibe I'm getting off the internet too from people who have actually been in beta using it. Most of the griping seems to be coming from people who have never even been in contact with a Kinect and just want to hate it on principle. It plugs into the USB port on the Slim and directly to the HDD of the old.